Steven (Chicagoland, United States) on 11 March 2014 in Architecture and Portfolio. 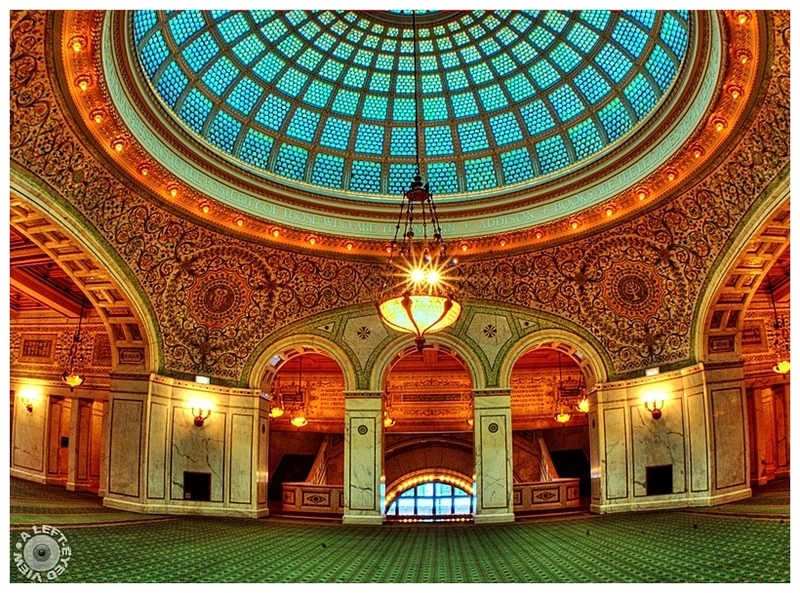 Approximately 38 feet in diameter, the Tiffany dome inside the Chicago Cultural Center spans more than 1,000 square feet. It contains approximately 30,000 pieces of glass in 243 sections within an ornate cast iron frame. The body of the dome has a “fish scale” pattern. The center, called the oculus, shows the signs of the zodiac. The interior stained glass dome originally was protected by an exterior translucent glass dome, which allowed much-needed natural light into what was then the Chicago library’s general delivery room. During this project, the concrete and copper exterior dome that had been added during the 1930s was removed, once again allowing natural light to shine through the glass. This was added, I was told, to protect the dome from enemy attack as the country entered World War I. Now, natural light pours into the room, changing the subtle colors of the restored glass minute-by-minute, while all of the room’s decorative elements glow and harmonize. In addition to cleaning and repairing the art glass, the ornate cast iron framework of the dome was given a new application of its original finish. Delicate rosette lighting around the cornice of the dome also was refurbished. The cost of restoring the Tiffany dome was approximately $2,200,000.00. What was interesting to note was the original cost of the building’s design and construction, including the Tiffany dome, was less than the cost of restoration. In early 1900’s dollars, it cost $2,000,000.00, with the Tiffany dome coming in at a cost of $120,000.00. It was also amazing by how much the colors would change in the Tiffany dome as the earth continued to orbit the ever-setting sun. After touring the entire building, I am still amazed at the construction of the building, the marble decor and the mosaic friezes, all at a minimal cost of $2,000,000.00. Along the bottom of the dome’s entire perimeter is a phrase by Joseph Addison (1672-1719) written in Roman lettering: “Books are the legacies that a great genius leaves to mankind which are delivered down from generation to generation as presents to the posterity of those who are yet unborn.” Remember that the building’s original function was a library when it was first built, not as a cultural center. Photo captured February 5, 2010. Superb, with a brilliant color union and a super exposure. Excellent angle and framing - love the vibrant colours. Interesting information as well. suchbeautiful frame, colors, lighting & details! A fine capture of this grand hall. The colors and detail are wonderful. Very well done. So beautiful !! And thank you for the explanations :books are a treasure ! A gorgeous image. That was a magnificent library in its day. This is absolutely beautiful. The interior is so ornate. So much attention to detail. That is an amazing dome. Wonderful narrative. It must have been amazing to walk through this building. Amazing room, quite nice photo. That certainly is a beautiful old building. Sweet shot.